The Page 69 Test: "An Unseemly Wife"
E. B. Moore grew up in a Pennsylvania fieldstone house on a Noah’s ark farm. The red barn stabled animals two-by-two, along with a herd of Cheviot sheep. After a career as a metal sculptor, she returned to writing poetry. Her chapbook of poems, New Eden, A Legacy (Finishing Line Press, 2009), was the foundation for her novel, An Unseemly Wife, both based on family stories from her Amish roots in Lancaster. E. B. received full fellowships to The Vermont Studio Center and Yaddo. She is the mother of three, the grandmother of five, and lives in Cambridge, Massachusetts. In the great sea of dark, she clung to the firelight. …A distant coyote yipped. If only (Ruth) could see a moon… its mouth open as if howling, yet silent as herself. Anything to dispel the dark. What foolishness. Wasn’t what waited beyond the fire’s light the same as she’d seen in the day, unrecognizable for now, a joy tomorrow, just as Idaho would be? All in God’s hand, a hand she knew but couldn’t see. 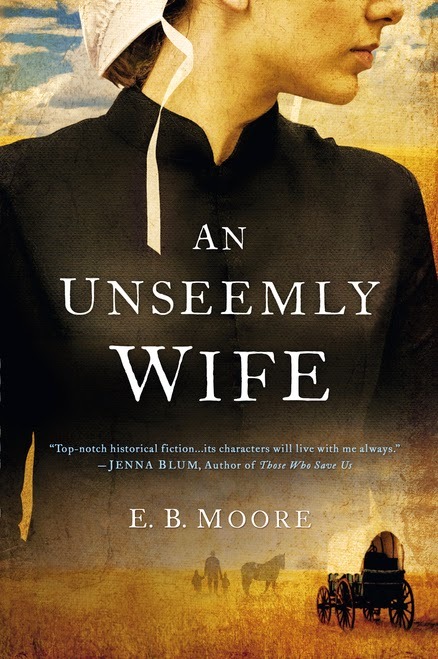 On page 69, Ruth’s loneliness and her desire to believe the unbelievable are at the heart of An Unseemly Wife. She was nine months pregnant, about to give birth, and against her will her husband, Aaron, bundled her, along with their four children age 11 down to 3, into a Conestoga wagon headed overland. They braved the unknown on a 2000 miles trek to claim free land in the west. Her upbringing said, obey your husband. Their Amish religion said, obey, but not this departure, not from the Fold and safety of their valley in Pennsylvania. Leaving the Fold went against the Old Order rule: stay separate. Aaron promised they’d keep their distance from all English. Despite this, his demand set off Ruth’s unseemly behavior, and she grew worse when they joined the dreaded outsiders. On the trail their very survival depended on being part of the English community. This included a preacher’s wife who wore grey, not the fancy colors of other women. She seemed like-minded, if overbearingly friendly. Another who crowded Ruth’s boundaries was an unnerving woman dressed in men’s fringed pants and jacket. Among them, friendships grew, even flourished until prejudice and jealousies lead to betrayal, and the separateness Ruth believed would save their souls, proved catastrophic, with the family abandoned on the trailside fighting for their lives.